AmericInn Lodge & Suites – The accommodations include options of whirlpool, fireplace, and kitchenette suites. Inside pool, whirlpool, exercise room, games, and an enhanced continental breakfast. Americas Best Value Inn – Room options include handicap accessible, and hot tub suites. Continental breakfast. Rainbow Motel – Outside entrance units on ground level. Antiques With Inn – A Victorian bed & breakfast with two second floor bedrooms, kitchen, bath, and parlor with fireplace. Wolf River Getaway – Year-round vacation home rentals on the Wolf River close to town. Hucklberry Acres Campgrounds – Open year-round. Restaurant and bar. Call ahead concerning a camp space during St. Patrick’s Day week. Rustic Wolf Inn – Three 1 br suites 10 mi east to Shiocton via hwy 54. Handicap unit. Lindsay House Bed & Breakfast – In Manawa, 13 miles to the northwest. 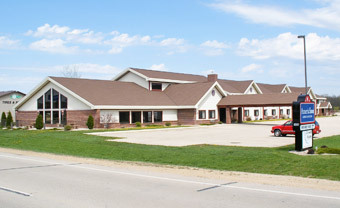 Manawa Motel – In Manawa, 13 miles to the northwest. Cobblestone Inn & Suites – At Clintonville 17 miles to the north via highway 45. The Landmark Motel – At Clintonville 17 miles to the north via highway 45. Appleton Accommodations – Lots of choices about 20 miles to the southeast via highway 15. Lamers Bus Lines – Offers a full array of transportation services including charter, shuttles, bus service, tours, and travel. Outagamie County Regional Airport (ATW) – Located near Appleton (about 17 miles). Austin Straubel International Airport (GRB) – Located near Green Bay (about 34 miles). The Waters – On the Wolf River on Wolf River Ave.
Hilby’s – Downtown at the corner of Wolf River Ave & Pearl St.
Jolly Roger’s Pizzeria – Downtown on North Water St.
El Tequila Mexican Restaurant & Cantina – Located where Midtown was downtown on North Water St. Crystal Falls Banquet Facility – Serves a Sunday Brunch, Double Bubble and Burgers on Wednesdays and Friday Fish Fry. Also, this is where the Irish Ceili event is held. Located in back of the AmericInn Lodge on Handschke Rd. Shamrock Heights Golf & Supper Club – Just north of town on old hwy 45. Pine Tree Supper Club – West on hwy 54 through Northport to Larry Rd. New London Family Diner – Near Festival Foods on the corner of N. Shawano St & Waupaca St. Familiar Grounds – Gourmet coffee, gifts and sandwiches just north of the Parade route on N. Pearl St. The Corner Cafe – across from the Dairy Queen near the end of the Parade Route. Beacon Street Deli - On the corner of Beacon Street & Mill Street. Marly’s Restaurant – Near the start of the Parade on the corner of South Pearl St. & Beacon St. The Pantry cafe – On the Parade route on South Pearl St.
McDonald’s, Burger King, Taco Bell, Domino’s, Little Caesar’s and Subway are located around town on N Shawano St., nearby the motels, downtown, in the Wolf River Plaza Mall, and the Hwy 54 & 45 intersection. There are also several grocery stores, a Wal-Mart, and a Walgreens on N Shawano St.
Grand Cinema Theatres – Quad movie theater complex in downtown New London.